Another thing I like to do is home improvements. 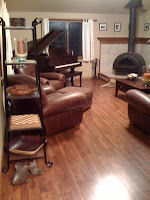 Here are a few of the biggest things I did to my house in Wisconsin before I moved. 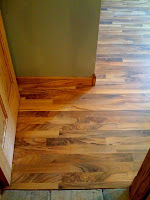 The flooring is laminate click-lock purchased from Menards. The stuff in the back bedroom was cheap, and I had a lot more problems with it chipping while tapping the boards into place. I didn't realize this until I started on the great room where a higher-end product was used and it resisted chipping from the tapping block much better. That flooring had the foam underlayment attached to the board too which eliminated a step in the installation process which was very nice and I didn't have any problems cutting through the foam with the saw either. I was really happy with how both floors turned out. I saved enough money doing it myself to justify the purchase of an entry level portable contractors table saw and still saved money in comparison to a professionally installed floor. It definitely increases the wow factor when you walk in the front door; although, it hasn't helped the house sell...yet.